for Soil Testing - This is identical to ZI 3018, except that the penetration pressure on the needle is conveyed through a hydraulic system to a hydraulic pressure gauge. This system permits a greater control over rate of penetration because of better visibility of load indication on the gauge. Specification : Comprises hydraulic proctor needle system complete with a pressure gauge fixed at easily readable angle reading 0-70 kg x 2 kg. A set of needle points consisting one each 0.25, 0.5, 1.0, 1.5, 2.0, 3.5 and 6.0 sq. cm. 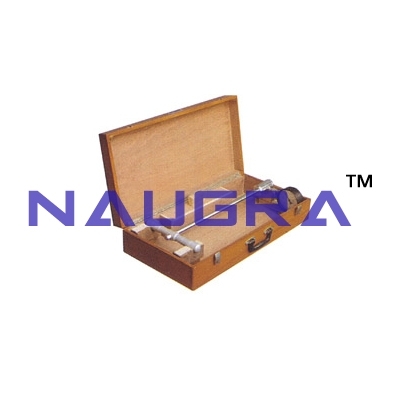 and a wooden carrying case..
We are leading manufacturers, suppliers & exporters of Proctor Needles (Hydraulic Type) For Testing Lab for Soil Testing Lab. Contact us to get high quality designed Proctor Needles (Hydraulic Type) For Testing Lab for Soil Testing Lab for schools, colleges, universities, research labs, laboratories and various industries. We accept bulk orders for government tenders in all countries around the globe. For similar products visit at main page of Soil Testing Equipments.